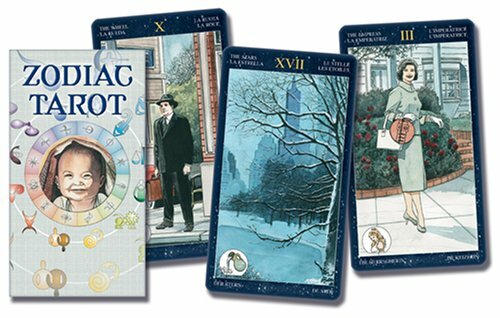 This is the last day I have slated for the Zodiac Tarot in this run. I am happy to end it on a friendly card: the Six of Pentacles (or Stones). Traditionally I associate this card with the concept of charity. Here, we see a inside the church. She appears to be lighting a candle. The “votive offering” is actually an ancient practice. It’s not hard to imagine her lighting a candle with a prayer for her husband, children or grandchildren. She appears confident in what she’s doing. And the healthy plants in the foreground suggest to me a certain kind of stability, you know? This is a place where they are well-cared for and grow. Being that we’re talking about a steadfast (Taurus) emotional nature (Moon), I’d suggest being both faithful and generous today. Send your good will (with prayer if you’re so inclined), do what you can to contribute positively, and expect it to be so. Do you have some good will to share today? Oh man…another rather uncommunicative illustration. Oy. At least it looks sharp in the red spread cloth. This watery/cloudy scene belongs to the Queen of Swords though, so we have some idea the vibe we’re talking about. And talking we are! The Queen of Swords tends towards emotive as that’s a built-in function of the Queens, but hers is an airy sort of emotion. She may have feelings, but she’s not going to go all broody-silent rolling around in them as the Queen of Cups might. She’s gonna let you know, man! And while logic and rationality are among her strong points, sarcasm and a sharp-tongue can follow frustration. Your best bet today is limit frustrations, be it for yourself or other people. And if someone gets sharp with you, try to let it slide with the understanding that it’s the water talking, not the air. If it’s you, catch yourself as soon as you can, and apologize. You may not fully “feel” it, but it’s probably the rational thing to do. Are you running across sharp words fueled by emotion? Today, the beauty and value (Venus) comes from the doing (Aries). That’s the message from this version of the Four of Wands. Maybe it’s an event in the traditional sense, or maybe not. Either way, it’s a great day for “putting your money where your mouth is,” as they say. Put your focus, energy and effort into what you most value and expect satisfying results. Anything else is anybody’s guess. It also turns into a value-added proposition. YOUR energy makes that which you value more valuable. Do you have plans to do this? p.s. Did you see the show yesterday? Got any feedback on it? This visual for the Princes of Clouds (aka Knight of Swords) doesn’t give us a lot to work with (Zodiac Tarot). Strictly speaking in terms of the astrology of the cards, we’ve got Air in Air. Airy! What’s clear though: It’s a day for words. How effectively those words communicate depends entirely on how they’re wielded. For the best impact, make sure you’re thinking is clear, rational and presented without equivocation. Waffling isn’t going to get the same results clarity of intention would earn. Which kind of makes it a perfect day for the first episode of Woo-Woo Wonderful. We’re airing HERE Saturday afternoon, 4pm/3 Central. Thanks for all the kind words of support and enthusiasm y’all have shared with Josi and I about this project. That HAS been clear—and greatly appreciated! I’m really hoping my mouth is in fine form. Send us good word vibes! How’s your mouth working today? Schedule a Tarot session here. Ten of Stones (or Ten of Pentacles to the rest of us) is associated with Mercury in Virgo. Here, we see a little girl picking flowers. This expression of the card is very, very physical, earthy and (as far as I’m concerned) beautiful. The sense of “richness”and a feeling of abundance can be accessed in very simple ways today. Sure, you can come across it traditioanlly via a family dinner in comfortable surroundings. But you can also find it in blooms other people would deem weeds. Think about what’s beautiful to you, whether someone else would call it a weed or not. P.S. Do you have your calendar marked for tomorrow? The first episode of our new video show, Woo-Woo Wonderful is airing right here live, 4pm/3 Central. Hope to have you join us!